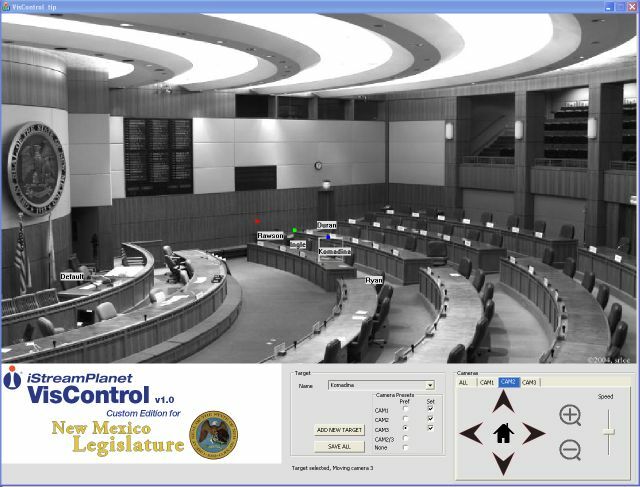 Every session of the New Mexico state senate since 2009 has been webcast using a computer application designed and coded by SpeakerToRobots. The chair recognizes one of the senators. When the senator begins to speak, one of three cameras has already swung into position and is webcasting the perfect image. The application stores over 50 preset positions for each camera, automatically selecting and moving the cameras into position whenever the speaker changes, using the VISCA protocol over RS232.